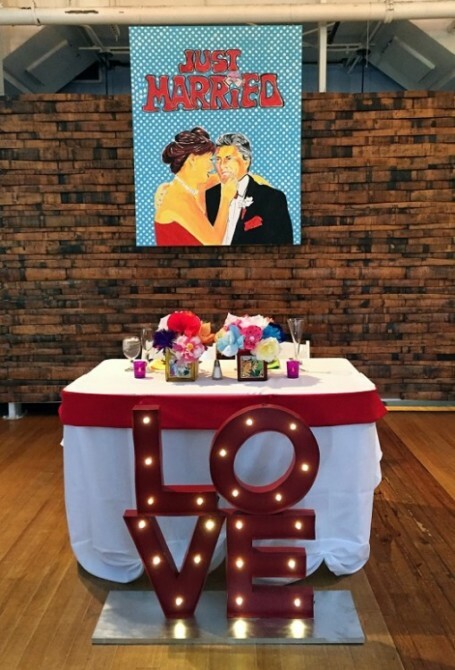 This weekend we had the pleasure of working with Michele and Scott on their amazing pop art themed wedding at the American Visionary Art Museum. As soon as guests entered the American Visionary Art Museum building, they knew this wedding was going to be far from “typical.” Pop art signs, which were hand made by the bride and groom, decorated the ceremony. The unique wedding surprises kept coming when “Art Poppa” arrived, decorated from head to toe, ready to officiate the ceremony (see picture below). The beautiful bride Michele dazzled in an amazing red wedding dress that she made which fit the theme perfectly. We cannot stress how many creative DIY projects there were at this exciting American Visionary Art Museum Wedding. After the ceremony, guests were invited upstairs to a room filled with DIY wedding decor done by the bride and groom for their amazing wedding at the American Visionary Art Museum. Pop art permeated the room with huge posters, an amazing cake, and tables decorated with bright colors, pop art paper fortune cookies, and AVAM “as seen on TV’s”. Before dinner, guests were treated to a performance by an aerialist. To go along with the entertainment, the bride and groom chose slow braised beef short ribs and a spring vegetable napoleon as entrees for their guests to enjoy. Guests finished the night with a delicious and perfectly decorated pop art cake made by Charm City Cakes. We are so thrilled to have been a part of Michele and Scott’s special wedding at the American Visionary Art Museum. We wish this absolutely wonderful couple a lifetime of happiness together! Error: Error validating access token: Session has expired on Friday, 12-Apr-19 20:42:14 PDT. The current time is Thursday, 18-Apr-19 06:26:21 PDT.